Hostelling International Boston was the only place to stay in Boston affordably and comfortably, as I quickly found. Also known as HI Boston, it is actually a chain of hostels available in the U.S. and Europe. 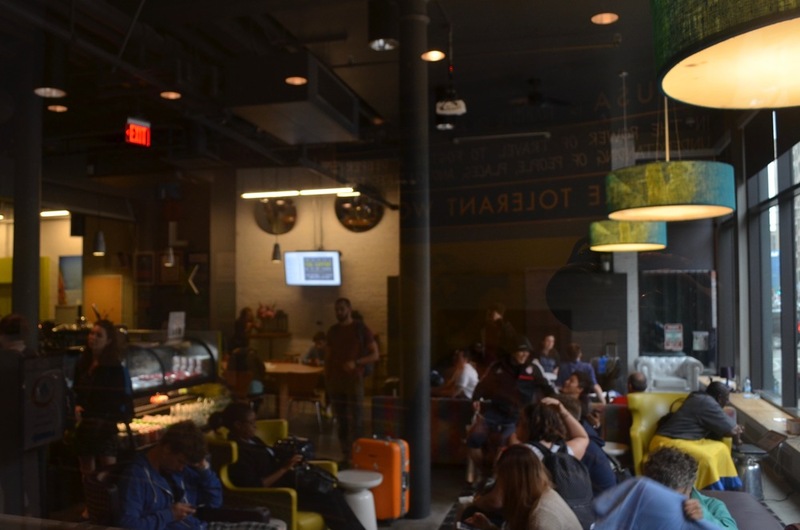 Because there are so few hostels in America, often Hostelling International is one of the only brands available and now I know that the quality of their brand and service makes them one of the best choices. When I first arrived in Boston, I had a different hostel booked for the first night, because while it was not as well rated as HI, it was decently rated and a few dollars cheaper. But after one night, I found that the hostel I was staying at was not worth the money—customer service was nonexistent, the bathrooms were dirty, the dorms crowded and dark. So I called HI Boston, crossing my fingers that I would get a bed over the holiday weekend. Soon I was dragging my luggage down the stairs of the T (the metro in Boston) on my way to Chinatown. My first impression of the hostel was that it was beautiful, clean, and big. The entrance and lobby serve as both a hangout and a waiting area, with big comfy couches and a fireplace. You can buy some basic snacks and drinks or hang out in the community room that has a projector for showing films and sports matches. 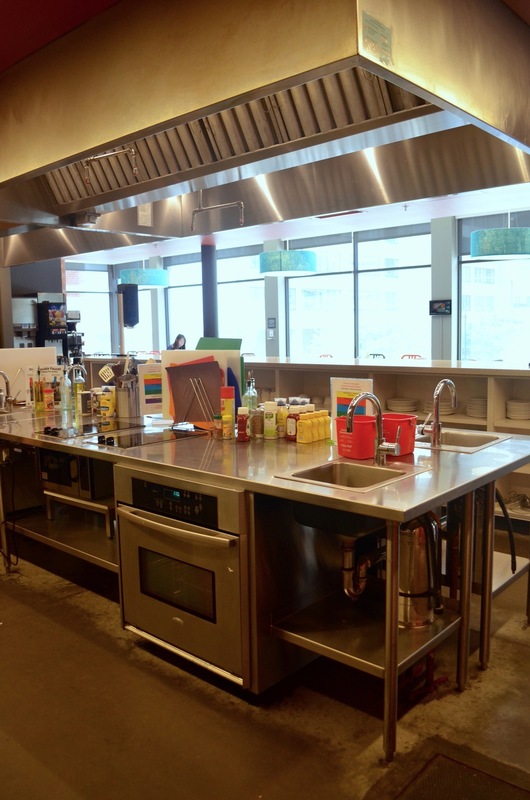 There is an industrial kitchen upstairs, where free breakfast (coffee, juice, yogurt, toast, bagels, and cereal) is served every morning and sometimes a free community dinner. But guests are free to use the appliances to make their own food, or grab a cup of tea or coffee anytime throughout the day. On the second floor is a laundry room, a book exchange, a pool table, and lots of places to relax and meet new friends. Then there is the community events board. 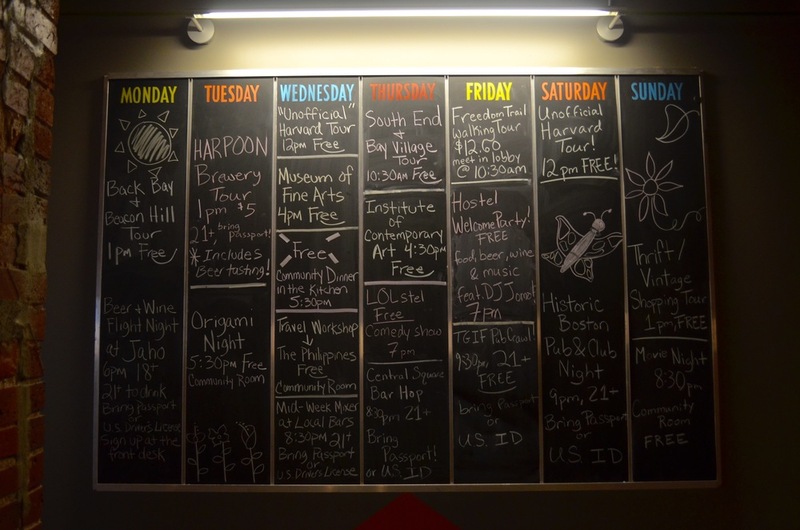 This is the magical board that is always full to the brim of cool activities, meet-ups, and free outings. That’s the best part about Hostelling International, they always have things to do and make it easy to meet other travelers. The rooms themselves are spacious and the bunks are nice. If you’ve never stayed in a hostel before, I can assure you that this is the best possible set up. Each bunk has a large locker next to it, that acts as a caddy for all your bags and valuables. Tip: Hostels don’t usually provide locks, either use a luggage lock or travel with a combination lock. By the head of each bed is a hollow part in the locker that has multiple outlets and a reading light. I used this as my bedside table, charging my phone and keeping my glasses and a book. This feature is great on the top bunk, so you don’t have to climb in and out of bed or store things on the side of the mattress where they could get lost. The bathrooms were awesome, because instead of large communal bathrooms, like in a gym, there were lots of individual bathrooms, each with a shower. As always in a hostel, the state of the bathrooms relies heavily on the other hostel inhabitants. While the cleaning staff did a great job, some bathrooms get untidy when travelers don’t clean up after themselves. It should be noted that while not all hostels provide towels (some charge you to rent them) they are included in the price at HI and it’s easy to switch out your towel for a clean one. 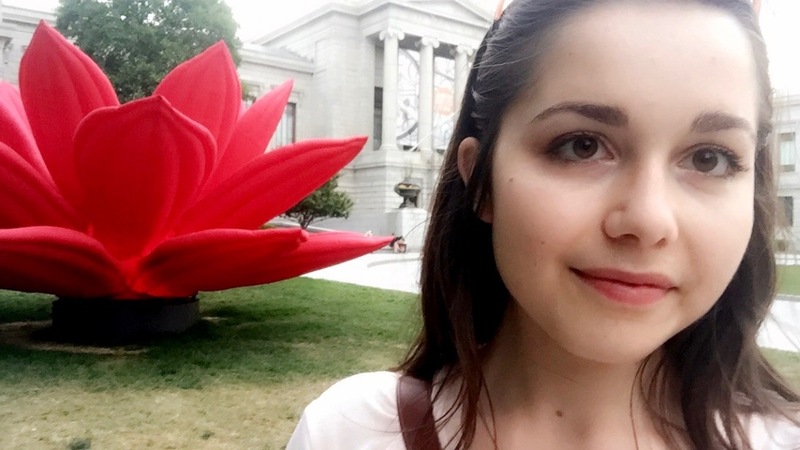 HI Boston is a beautiful and affordable place to stay, whether you are a lone traveler, a couple, a family, or group of friends. It’s the first hostel I stayed at where there were so many different ages and groups of people. There are many dorm rooms (which are usually smaller so people aren’t constantly coming and going) as well as private rooms. HI has a great setup with lots of amenities so that you can be comfortable and meet other travelers. 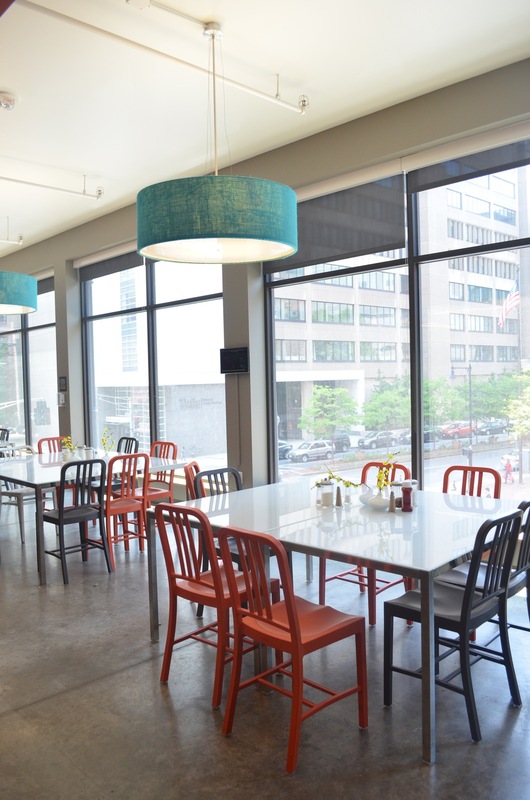 While I initially balked at the cost, with breakfast and so many other extras included with amazing service you won’t find another hotel or hostel in an American city that is so worth the value. When traveling in the U.S., Hostelling International would be the first place I would look. 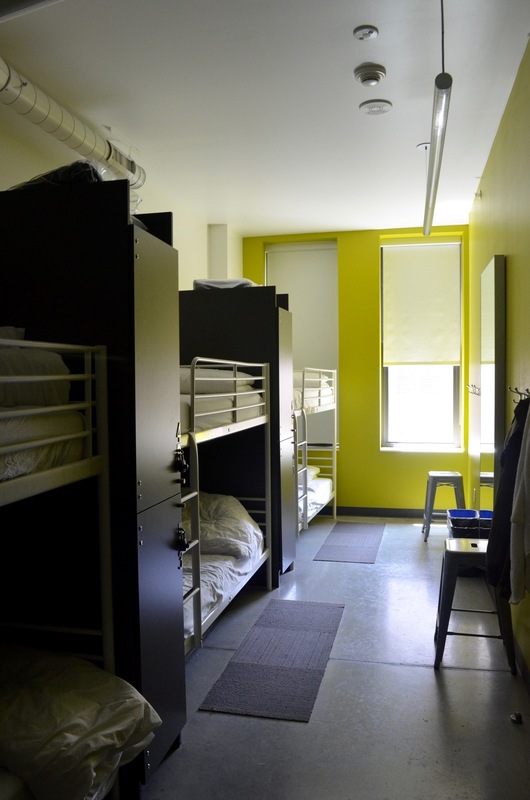 Dorms come in mixed gender, female, and male and vary in size. Large rooms (8 beds) are cheap than smaller (4 bed) dorms. For one bed in a 6 bed dorm it is $44.49 Sunday through Thursday, and then $59.49 on Friday and Saturday. There is also a $3 charge per night if you are not a member; membership is $28 a year. Private rooms can vary in price depending on the day of the week and the season, but on average in June a double room is about $220 per night. Disclaimer: This post was written in partnership with HI Boston. As always, the opinions expressed here are completely my own. Recently I took my first trip to Boston, even though the flight only took me an hour from Baltimore. Why there, you ask? I've always wanted to visit (that's probably the history nerd in me) plus I had credit from a flight that I had cancelled. And yes, I was traveling alone, per usual, because no one could come with me, but I wasn't going to let that stop me. Here are all of the best things I did, the good food I ate and the interesting places I saw. I don't know if it's just me, but I love to hang out in parks when I'm in a new city. There's always a ton of people watching, mostly of locals, and it can be an escape from the smell and containment of a big city. Lucky for me, the weather is finally starting to feel like summer on the East Coast, so I could simply find a sunny spot and settle down. Everyone of course knows of the Boston Common, but across the street from it is the Public Garden, which is honestly so much prettier. 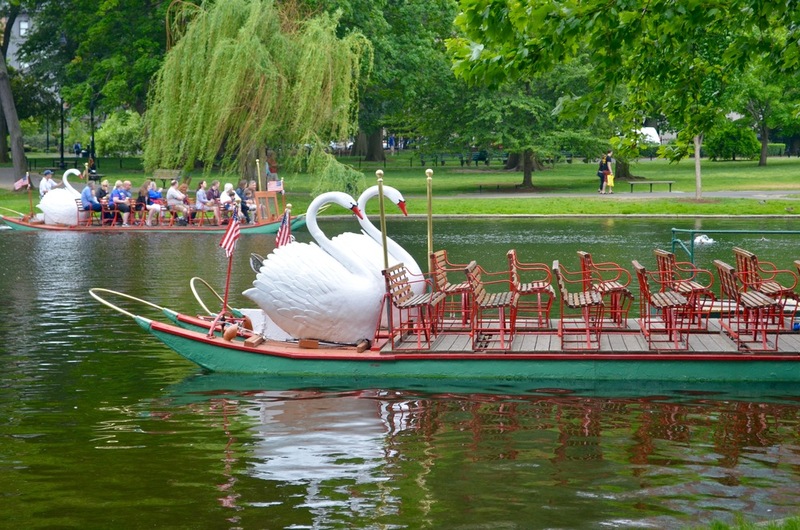 Here are the famous swan boats, surrounded by weeping willows and fountains. 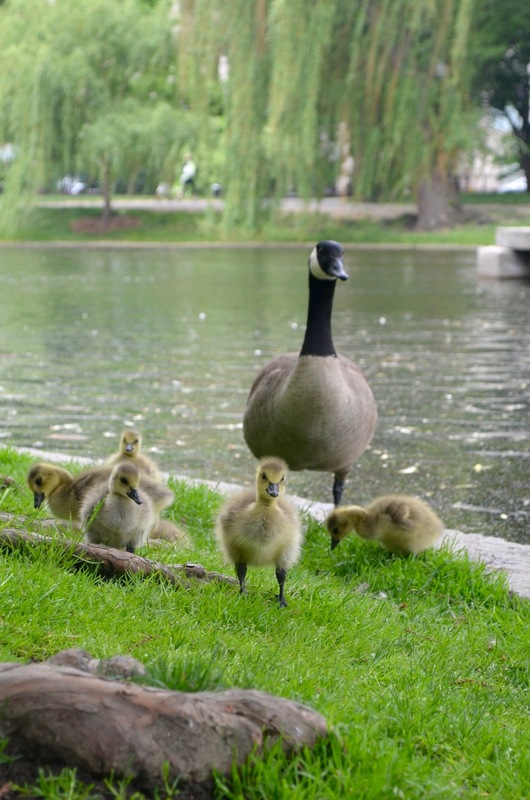 Perfect for reading, sketching, a good conversation, or capturing the cuteness of some goslings. 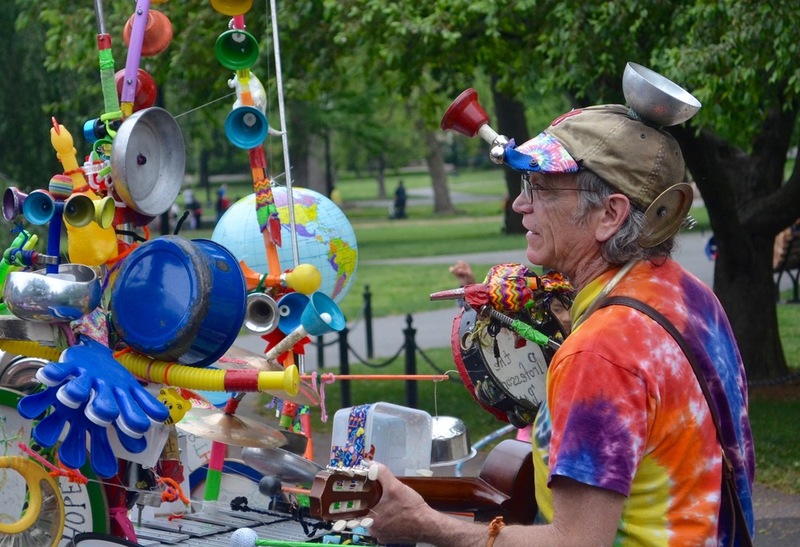 I found a one man band! This place was recommended to me by everyone I know who lives in the city. It is the house-turned-museum of an art lover and collector. But it is much more than that. 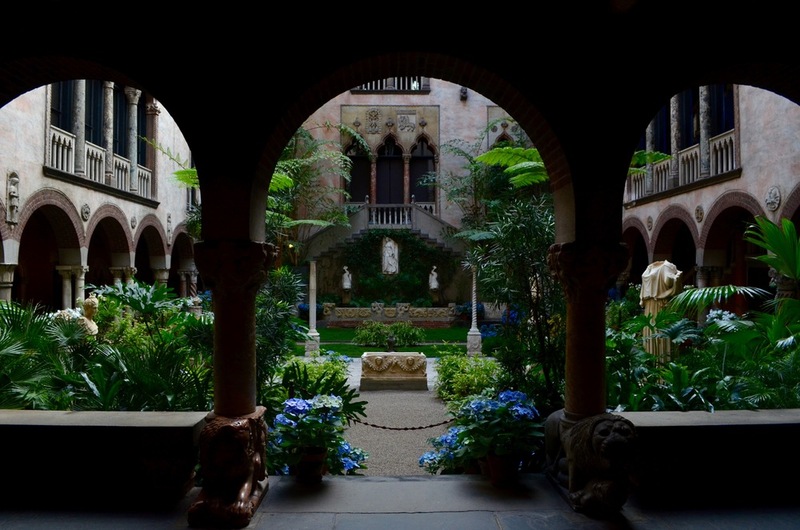 There is a greenhouse, antiques and pieces of other countries, and the most beautiful courtyard you will ever set eyes on. Seriously, I could have spent all day just overlooking the courtyard. I took a free tour while I was there that consisted of a staff member choosing a couple of paintings and having us analyze them. I would definitely recommend to anyone who visits to go on such a tour, as it helps those who don't have a career in art understand and appreciate what they are looking at. There is a wide variety in the art, from Renaissance Italian oil paintings to contemporary pen studies. If you are artistic, take your camera or sketchbook, but know that they will only let you use pencil. This is one museum that is worth every penny of the cost, which is $15 for adults, $5 for students, free for anyone under 18 or those named Isabella. Soon after my purse strap broke and I was carrying all of my daily supplies under an arm, I came across a little French bakery, that bore the French version of my name. Well of course I had to go in, where I was dismayed to find the cases were cleared out. But there were a few tarts and cookies left, and the man behind the counter told me to go for the chocolate chip. I thought that I had had lots of good chocolate chip in my lifetime, but took his suggestion anyhow. Hands down the best cookie I have ever had. Large, with crispy golden edges, a slightly under-baked center and gooey, melted chocolate overwhelmed me. I actually wrapped up the last third to eat later because I was afraid that I was not savoring it enough. I would love to go back to this place and test out more confections, or watch the pastry chefs making their masterpieces through the large glass window in the back. Another park (Why do I visit so many? Well they are free, pretty, a taste of local culture, so why not?) but this one stretches long against the Charles River. 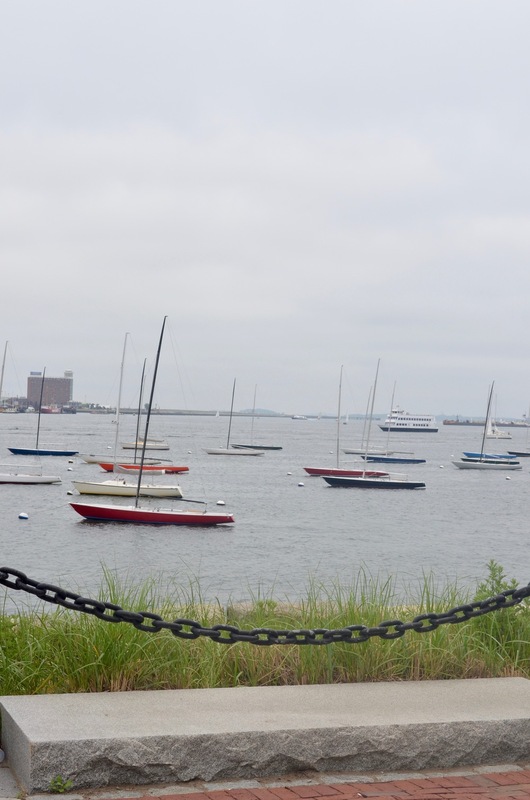 It is a great place to sunbathe, as many Bostonians do, or watch the sailboats go by. 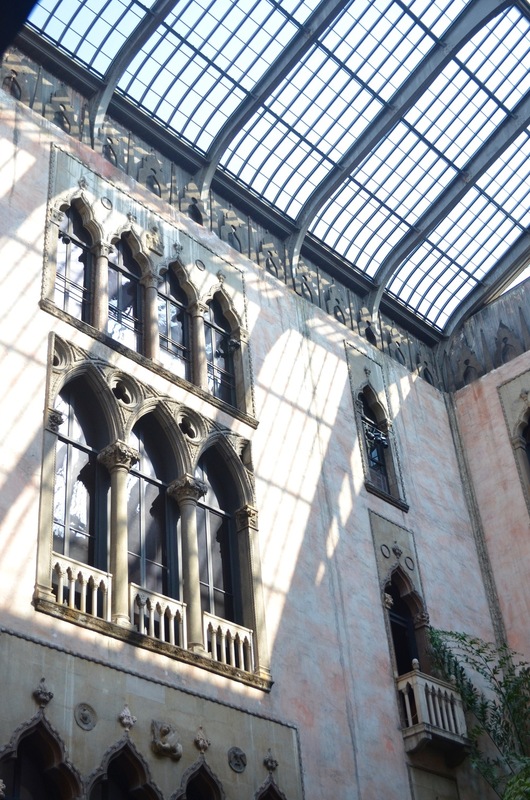 The Boston Public Library is like a castle. I couldn't believe how gorgeous it was: the domed ceilings, tile work, and columns make it look like a piece of a fairy tale. They have tours during the week at certain times, however you can go exploring on your own and for free. Take time to look at the architecture and appreciate the gardens behind the library. Saus that cute little place where you can grab their famous fries also known as poutine, a Canadian dish with french fries covered in cheese curds and other toppings. It's called Saus because of the many dipping sauces. It's super casual and not too expensive, but absolutely yummy. I grabbed veggie croquettes in a pita for a light dinner, which had this amazing spicy 'Samurai' sauce on it. Also, they have many specialty drinks and beers. The Holocaust Memorial is right by Saus which is how I found it. The memorial is simply a walkway with different towers of glass that extend into the sky. At each tower, there is smoke coming from the floor and a quote or story written on the wall. This was very beautiful and well thought-out, making it the perfect place to reflect for a while. I went to the HarborWalk on my last day when it was a little bit cloudy. Still it was a great way for me to see the harbor and the North End of Boston. There are many locals who run, walk their dogs, or go with children to the HarborWalk. It is very long and you can start at many different places; however, I suggest starting at North Station and walking down towards the aquarium. I imagine on a sunny day that the pictures would be even more beautiful and more ships would be out on the water. 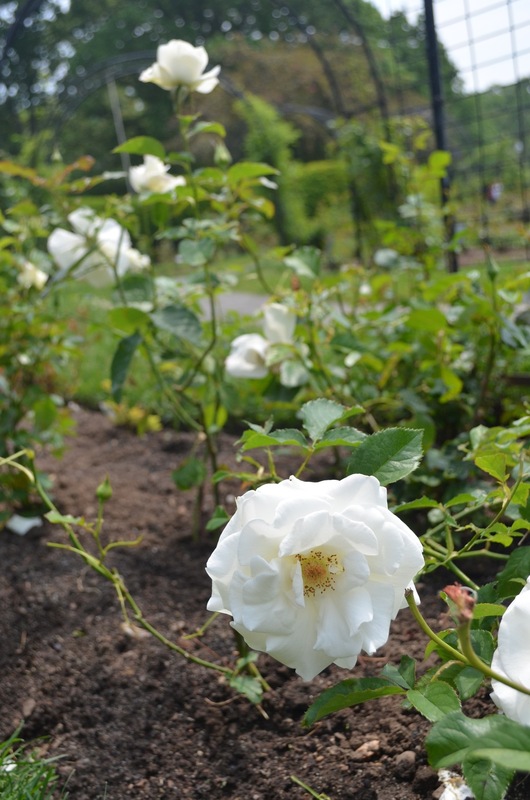 I read about this rose garden on Yelp and nearly couldn't believe it. I decided to try and visit so I picked up some lunch and I headed over to eat there. 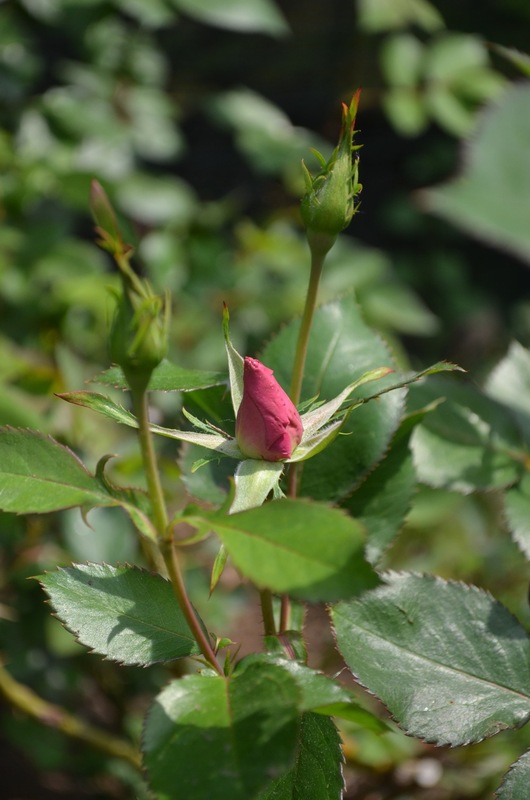 It was a little hard to find at first as the hedges reach up and hide the garden itself. Inside I was the only one there, accompanied by just a few roses--as it was out of season--and some gorgeous sculptures and landscaping as well as a lot of privacy. I got out of there right in time as a camp group of kids came in and started playing tag, but when I was there alone it was perfect. Render Coffee is where I bought that lunch to have in the rose garden, a goat cheese quiche that was quite large. People say that this is the best coffee in the city which I can’t speak to personally as I did not get a coffee; however, I did get a chai tea latte which was honestly just okay. But that goat cheese quiche was great! It was thick with fluffy egg and spinach topped with big pieces of fresh goat cheese wrapped in phyllo dough. Extremely satisfying and perfect for a picnic at the gardens. 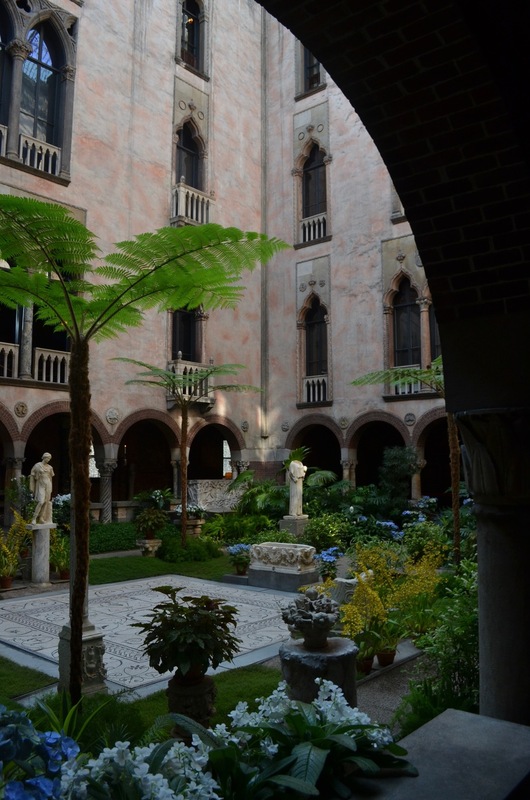 This is more of your typical museum than the Isabella Stewart Gardner museum. That said, it has many beautiful pieces and is quite large. I would recommend a few hours, on a Wednesday after 4pm as this is when admission is by voluntary donation and it is open until 10. The highlights were definitely the American artists, with a whole room devoted to John Singer Sargent, the Monet room, the many Homers, and the contemporary works. The third floor was devoid of visitors when I went, and filled with a beautiful modern exhibit of "The Idea of North" featuring glaciers and arctic landscapes by Lawren Harris. Also, don't be afraid to explore around corners and down hallways, as on the second floor there is an interesting hidden 'behind-the-scenes' exhibit about art collection and preservation. This may seem obvious, but adventuring through the historic Beacon Hill (sans a tour guide or map) was perfect. The buildings speak for themselves, and I found myself gazing down alleys and admiring window boxes. 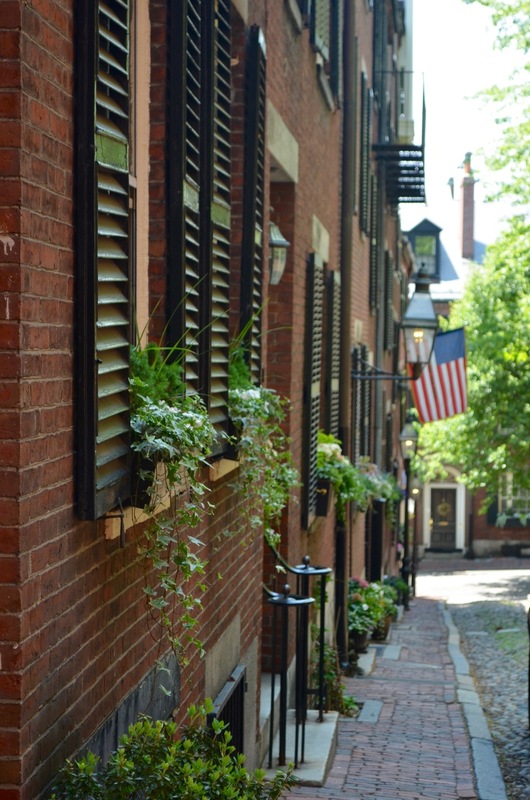 The famous and often pictured image of Beacon Hill is Acorn Street, which is a narrow, cobblestone street lined in townhouses. 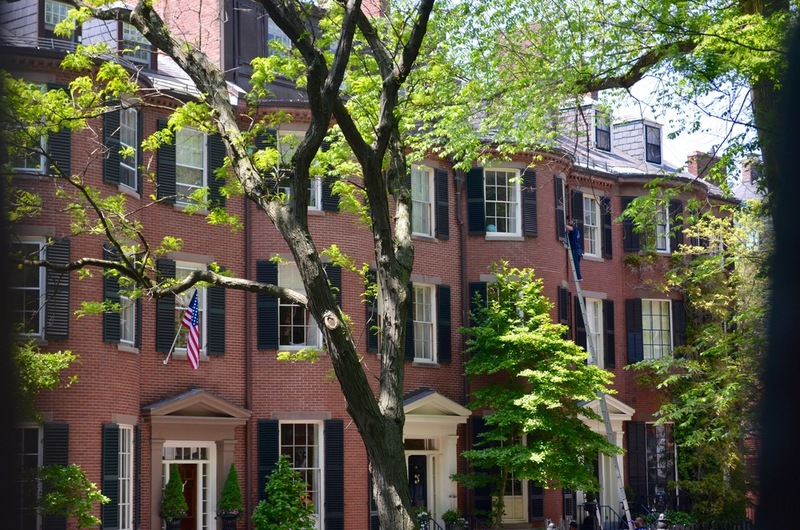 Louisburg Square is one of the fanciest set of houses in the area, arranged around a small private park. 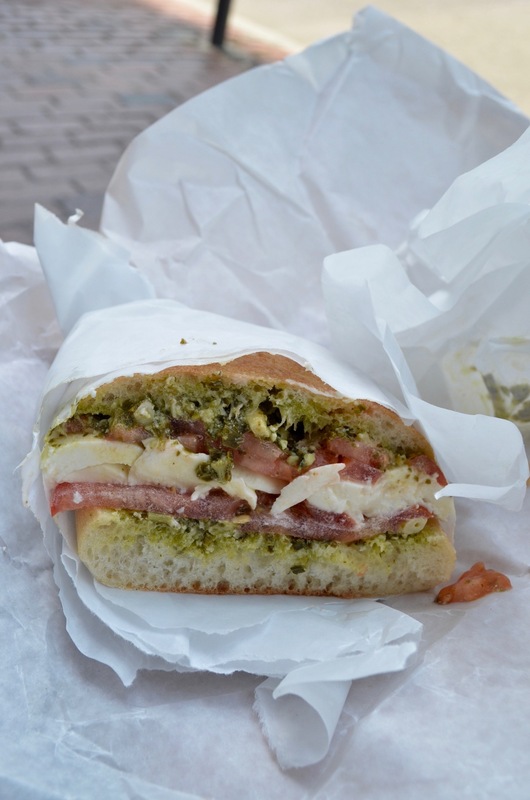 On the go and looking for an inexpensive lunch, I opened the door to Deluca's grocery near Boston Common. While the foreign food on the shelves looked good, albeit a little pricey, I headed towards the deli in the back. I ordered a tomato and pesto sandwich with fresh mozzarella on a ciabatta roll. I was so hungry that I plunked down on the bench outside and ate half. Simple and good. I think my sandwich actually drew jealous glances, as one man passed me and then turned to his family asking if anyone was ready for lunch. Ok, so this one I'll cut short, because you can read an entire post on it here. Pressed is a healthy juice joint in Beacon Hill. There are salads, sushi, shakes, popsicles (or paletas as they call them), and juices all with awesome ingredients at somewhat steep prices. 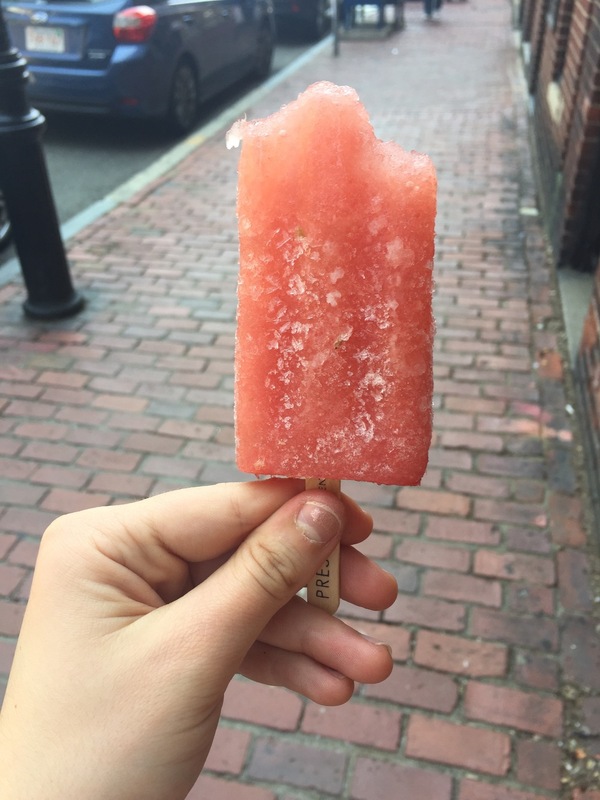 Because I just wanted a snack (and not a $10 shake), I went for a popsicle (~$4) in watermelon and jalapeno. It was juicy and sweet like biting into a watermelon slice, quickly followed by the heat of the peppers. The other flavors range from cardamom vanilla plum to raspberry hibiscus. Truly a unique experience if you are willing to splurge a little. My hostel was right next to Chinatown, so I often walked through it on the way to other places. But there are many little restaurants and funky little shops that are worth a look. I went looking for a cobbler to repair my purse, instead I found a parade of drums and dragons in the streets, which was followed by many Chinese men in business suits and red ties. I can only assume it was for a holiday--whatever it was, it sure was fun and entertaining. The one night I was looking for an easy, yet good dinner in Chinatown. I came across a sign in a window to go in the building and up the stairs for My Thai Vegan Cafe. Being intrigued, I went up for a look and ended up at a table for one. Although the servers didn't know how to treat a solo guest (service was minimal and without any extras), the food was some of the best Thai I've had outside of Thailand. The menu is ginormous and filled with a plethora of fake meat, so I opted for Pad Kee Mao with tofu, which was their take on drunken noodles. Even better was when I ordered a mango smoothie bubble tea to go. Made with coconut milk and fresh mango (I'm assuming from the pieces of fruit I encountered) this is probably the best bubble tea I've ever had. This little hut of a coffee place is easy to miss. But if you duck into the one-room building with a slanted roof near the Haymarket T, you'll get a damn good coffee. I tested out their cold brew, which was rich and flavorful, while sitting on one of third mini tables outside and watched everyone go to work. There are many towns on the edge of Boston worth a visit; however, the most famous would be Cambridge. 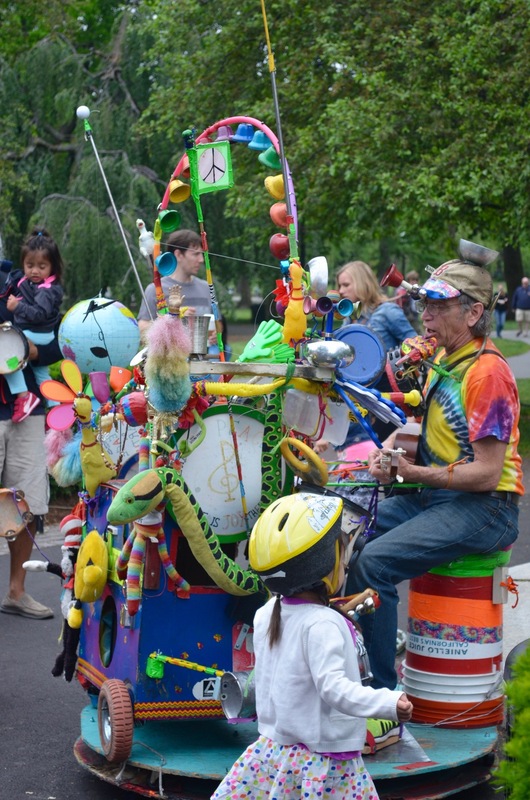 Be on the lookout for a post that details how to have the perfect day in Cambridge soon.